Most of us think that cakes with eggs are the best, but trust me eggless cakes are fabulous and spongy as much as like the cakes with eggs. I have be experimenting eggless versions of cake, as like everyone some of my eggless cakes are disaster while few cakes came out extremely spongy and soft as much as like cake with eggs. Today am running my last week of blogging marathon before we kick start our long blogging marathon next month, the theme for this week is Eggless cakes with different subsitutes. 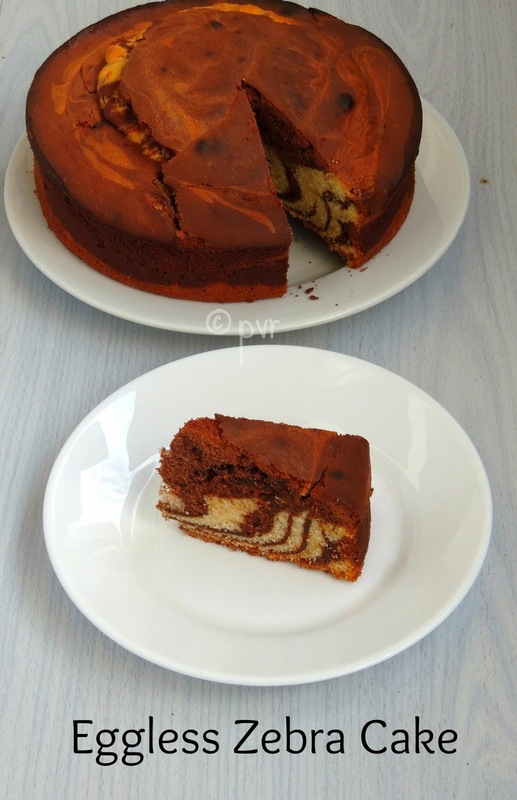 My today's post is Eggless Zebra cake, i replaced eggs in this cake with hung curd and milk. Actually for this week's Fond Bites-Bake Along, a weekly event by Subhashini, she suggested a super Marble vanilla chocolate cake for this week's challenge, i couldnt resist to make mine at home as eggless cake but as Zebra cake.Every week we get to know about the week's challenge on sunday and the members of this group should bake and share either in their blog or with the group members before the next sunday. Seriously am having real fun with this group actually learning so many different bakes every week. The original recipe shared by Subhashini goes for 4 eggs, i replaced them simply with hung curd, do you know hung curd works fabulous as egg substitute.However this cake goes for butter,if you want your cake as a low fat, you can replace the butter very well with oil, but once a while its nothing harm to bake a cake with butter rite. If you are planning an eggless cake next time, give a try to this hung curd substitute and am sure you will definitely get your eggless cake with a fantabulous spongy texture.Check out the Blogging Marathon page for the other Blogging Marathoners doing BM#43. Grease a round baking pan, keep aside. Sieve the baking powder,salt,flour together and keep aside. Beat the butter and sugar together until the mixture turns soft and pale. Add the hung curd,vanilla extract beat again for a while. Divide the flour mixture and the milk as two equal part. Add a part of flour mixture and milk to the beatened butter, give a stir. Now add the remaining flour and milk, mix everything well. Melt the chocolate in double boiler method or in a microwave oven. Now divide the cake batter as two equal portion, add the melted chocolate to a portion of cake batter and mix well. Drop a small ladle of vanilla cake batter, now drop a small ladle of chocolate cake batter over the vanilla cake batter, continue the same process this way until the batter gets finished. Bake in middle rack for 30-35minutes until a skewer inserted comes out clean. Remove the cake from the oven, let it cool completely on a wire rack. Enjoy with your favourite drink. Wow looks so good and hung curd is a real good substitute. .I have still to try this for my bakes...the cake looks spongy. Butter and oil have about the same amount of calories. Don't know anything about hung curd..is it a type of yogurt? perfect stripes within, Priya !! Perfect zebra pattern you have got. Lovely adorable cake. 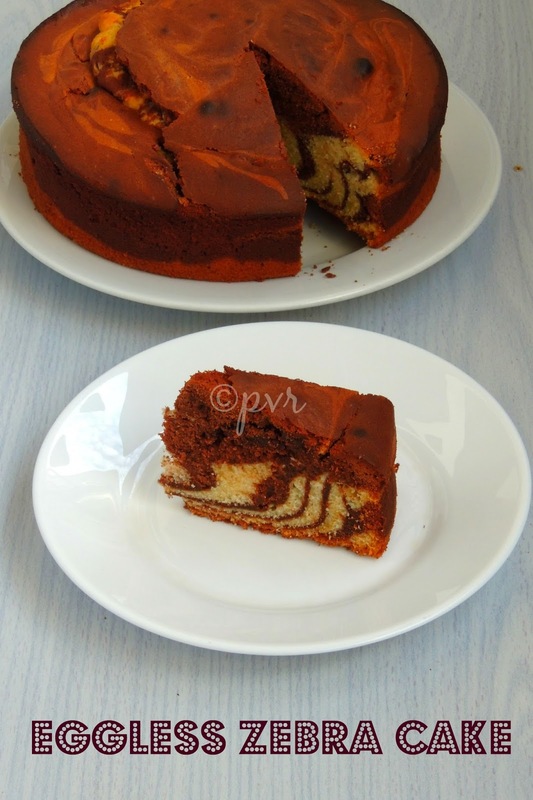 What a stunning marble cake...... Soft and moist !! 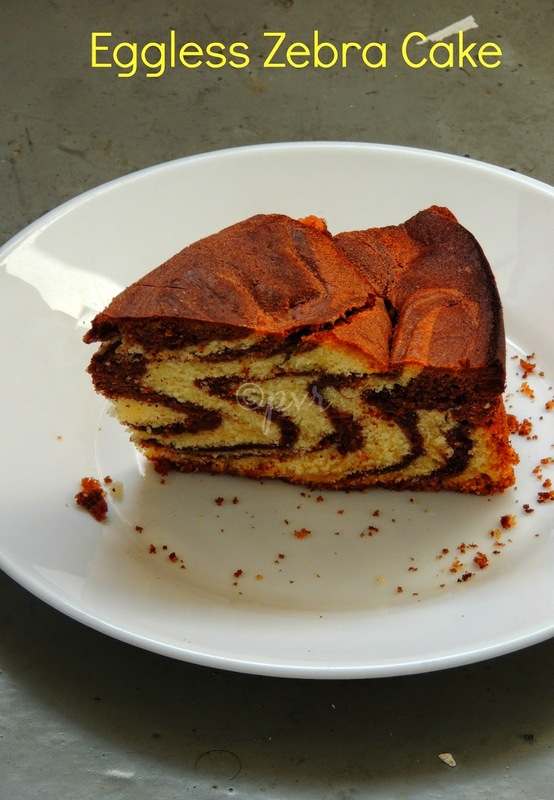 Its in my to do list to make eggless zebra cake too... looks perfect and so spongy :) I wud to grab one piece now !! Cake looks awesome! The zebra pattern is beautiful. The cake has come out fabulous. Priya did you half the recipe or substituted 4 eggs with 1 cup hung curd? Beautiful looking cake, like your egg substitute, will use it next time. @Suma GandlurYes I used 1 cup of hung curd and also increased the quantity of the milk than the original recipe, i didnt halved the recipe..Hope this help..
That is a stunning marble cake, Priya. Totally in love with the pattern! who eat all these cakes akka..i will shift to paris..to ur place..